We're back from a lovely family holiday centered around Zion National Park and Bryce Canyon. It was awesome! I highly recommend a visit. River hiking in the Zion Narrows (with a butterfly). Voluntouring at Best Friends Animal Sanctuary (and walking a pig). The buffalo at Zion Mountain Ranch (and feeding the chicken). Solitude at Observation Point (except for the bird). Hiking into the depths of Bryce Canyon (beneath Thor's Hammer). The pools of the Desert Pearl Inn and Mandalay Bay. Watching our kids watch the Fountains and the Volcano. 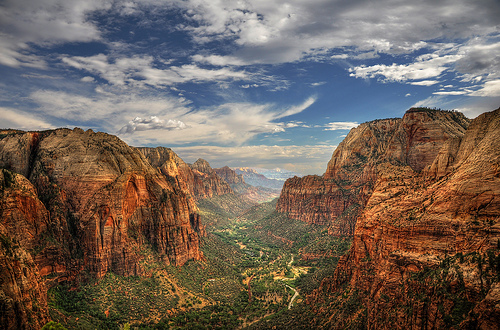 Of course, what I will remember most clearly is the amazing view from Angels Landing. Hiking the narrow rock fin with dizzying drop-offs on both sides was among the most terrifying and most fun experiences of my life. So, please do tell, where should we go next year? Those are some great suggestions. Thanks Jim! I already watched the first two parts and found them truly inspiring.